Drums are the means by which power is transmitted to the rope and thence to the object to be moved. For the wire rope to pick up this power efficiently and to transmit it properly to the working end, installation must be carefully controlled. The end of the rope must be secured to the drum by such means as will give the end termination at least as much strength as is specified by the equipment manufacturer. Adequate tension must be maintained on the rope while it is being wound so that the winding proceeds under continuous tension. The rope must follow the groove. It is preferable to have at least three dead wraps remaining on the drum when the rope is unwound during normal operation. Three dead wraps are a mandatory requirement in many codes and standards. If the wire rope is carelessly wound and, as a result, jumps the grooves, it will be crushed and cut where it crosses from one groove to the other. Another, almost unavoidable problem is created at the drum flange; as the rope climbs to a second layer there is further crushing and the wires receive excessive abrasion. Riser and filler strips may help remedy this condition. Another factor that must be given serious consideration is the pitch of the drum grooves relative to the actual rope diameter. Wire rope is normally manufactured to a plus tolerance. (See Table 3.) If this oversize tolerance in the rope is not taken into account, it can mean severe damage. As an example, a grooved drum made for 1/4-inch rope may have a pitch of .250 inches. Yet, by Federal standards, a 1/4-inch rope may have a diameter as large as .265 inches. If a rope of this size were to be operated on a drum with a .250 inch pitch, crowding would occur and the rope would be forced out of the groove. And that there are at least two dead wraps on the drum when the rope is fully unwound during normal operating cycles. Loose and uneven winding on a plain (smooth) faced drum can, and usually does, create excessive wear, crushing and distortion of the rope. The results of such abuse are lower operating performance and a reduction in the rope’s effective strength. Also, for an operation that is sensitive in terms of moving and spotting a load, the operator will encounter control difficulties as the rope will pile up, pull into the pile and fall from the pile to the drum surface. The ensuing shock can break or otherwise damage the rope. Figure 32. 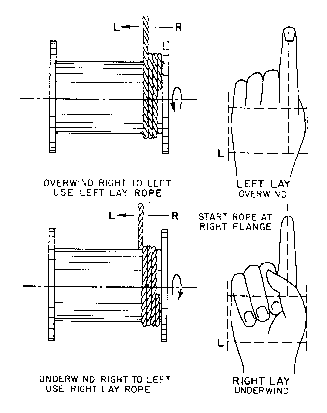 By holding the right or left hand with index finger extended, palm up or palm down, the proper procedure for applying left- and right-lay rope on a smooth drum can be easily determined. The proper direction of winding the first layer on a smooth drum can be determined by standing behind the drum and looking along the path the rope travels, and then following one of the procedures illustrated in Figure 32. 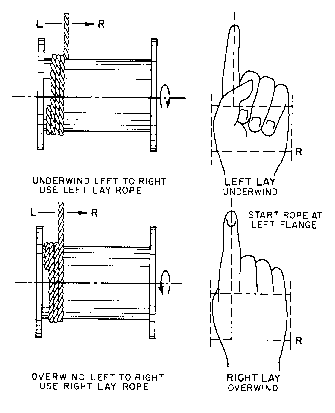 The diagrams show: the correct relationship that should be maintained between the direction of lay of the rope (right or left), the direction of rotation of the drum (overwind or underwind), winding from left to right or right to left.